This comment was posted to reddit on Nov 06, 2016 at 9:49 pm and was deleted within 35 minutes. But you just stated earlier that the helicopter is flying horizontally, so that cannot be the case. The reason the cable is 20 degrees from the vertical is that the helicopter is accelerating horizontally. The helicopter is accelerating because of the propulsive force on it. You have the right idea with the vertical component of the propulsion. If the helicopter is flying horizontally, there's no net vertical motion, and thus no net vertical acceleration. So, the vertical component of the propulsion force is simply equal to the gravitational force acting on the helicopter-crate system. Your calculation of the horizontal component of propulsion is wrong, however. You don't divide by the tangent, you actually divide by the product of the sine and cosine. Here is a free body diagram (crappy Paint skills, I know) of the crate to explain. In it, the helicopter is the frame of reference. Because the helicopter is accelerating horizontally, the free body diagram is in the context of a non-inertial/accelerating reference frame, and when we use an accelerating object as a frame of reference, we have 'fictitious' forces at play. 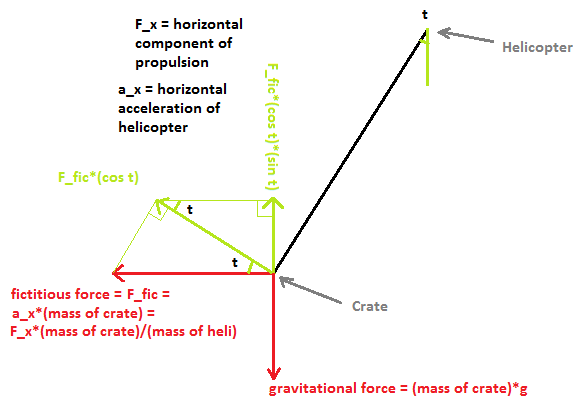 In this case, the 'fictitious acceleration' of the crate is simply equal to the acceleration of the helicopter in an inertial (standard) reference frame. Anyways, the vertical green arrow is the component of the 'fictitious force' forcing the crate up, and gravity is pulling the crate down. So, their difference should be 0 when t = 20°.